When did you take up this sport and what prompted you to do so? I started competing in aquathlon events (swimming and running) nine years ago. Given that I was already involved in swimming and didn't have a bicycle, it suited me. However, within a few months, I bought a bike and started training and taking part in triathlons in Catalonia during the summer of 2010. 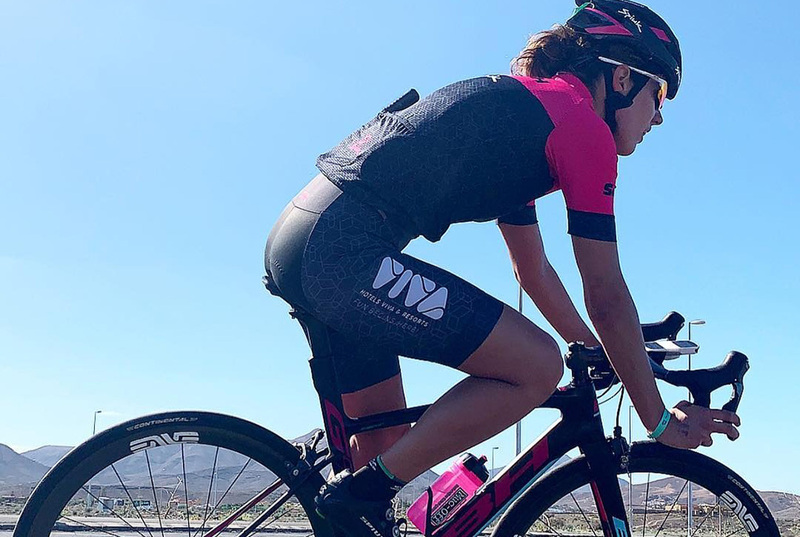 My love for outdoor sports and living in Banyoles, a city that simply invites you to do sports the whole time, were factors that encouraged me to run and get out on my bike. We know that you studied Marketing and Communications, but did you really imagine devoting yourself professionally to this sport? To devote yourself body and soul to a sport is easy if you love what you do. I think the hard part is making a living from it - which is why my studies and ongoing learning have always been a priority for me. We imagine that the demand from this sport is very high, so we'd really like to know what it's like for you. What has it given you on a personal level? On a personal level, sport has given me values that I now consider to be essential: values such as discipline, respect, perseverance, effort, self-improvement and empathy. And, above all, I consider that the sport makes me value what I have more. Could you tell us briefly what a professional triathlete's day is like? What are the key routines if you want to be a top-level triathlete? The truth is that our day-to-day routine can seem quite boring, because every day is similar: we train for the three disciplines over 3 or even 4 sessions (we usually run twice on several days a week), we eat, rest and do little else. And we do it 7 days a week. During the event season (which runs for just over 11 months) we rarely have a "do nothing" day. For us, there is no difference between say a Monday and a Saturday. However, this routine and discipline is what we like and it's what we believe we need in order to keep growing as sportsmen and women. We know that you're in the top 20 of the world series How many medals do you have right now? My greatest achievements so far have been taking part in the Olympic Games in Rio de Janeiro, and coming fourth in the Edmonton World Series in 2015. Could you tell us a bit about what it feels like duringa race? How does it feel to win? The feeling you have during a race is usually one of suffering - which is why you have to try to stay motivated and optimistic at all times. And at the finishing line, the way I feel is satisfied to have given my best. What do you most appreciate from training at Hotel VIVA Blue & Spa? The facilities and equipment offered by the Hotels VIVA: the heated swimming pool, 24/7 gym, spa, special food for sportsmen and women, exclusive facilities for cyclists: lockers, specialist shops, water bottles and so on... And without a doubt, the staff too, who provide a huge amount of immeasurable value. What do you like most about the island of Mallorca? What always stays with me about Mallorca are its landscapes, people and cuisine. This week includes International Women's Day: Do you think of triathlon as a mixed sport? I think triathlon is a very equal sport between men and women. We follow the same calendar and have the same sport events as men, we run the same distance, have the same financial prizes and so on. And at the forthcoming Tokyo 2020 Olympics, triathlon will for the first time have a mixed relay made up of two women and two men. Less than a year ago you had a major accident on your 28th birthday. How's the recovery going? What has helped you get through this difficult period? Are you now fully recovered? My recovery has gone really well - thanks mainly to the support of some great professionals (doctors, physiotherapists, my trainer) and the love and support of my family and friends. I'm now training and starting to compete again. And although I'm still a long way off my best, I'm very happy to be able to be doing what I like best again.